Jeremiah Chapters 14-17 Star Chart: Clockwise from when the "little ones (Gemini) ... came to the pits, and found no water" (black moon) and "they returned with their vessels empty" (black moon) and "they were (red radius line) ashamed and confounded, and (sun-) covered their heads" (14:3) in 606 B.C. to when "I will (red radius lines) fan them with a fan in the (solar) gates of the land; I will bereave them of (Gemini) children, I will destroy my (Gemini) people since they return not from their ways" (15:7) in 604 B.C. is TWO YEARS or 24° months. The "YEAR of drought" (17:8) doesn't limit the total time span to merely one year since 14:1 mentions "DROUGHTS" plural or batzorot (see ISR; JPS; OJB) meaning TWO YEARS in this case. This famine occurred in the reign of Jehoiakim, since we read of a FAST in his time (Jeremiah 36:9), and it appears that there was a FAST at this time, though not acceptable to God (14:12). This FAMINE was before the fourth year of Jehoiakim (604 B.C. ), because nowhere in the discourse is the enemy mentioned by name as known. The northern iron (15:12) and the north country as the place of exile are all that are mentioned (16:15). The prophet, when he delivered this discourse, must have been a long time in office because the hatred against him has become much deeper and more general (15:10): he is mocked, because the fulfilment of his prophecy is so long delayed (17:15): he moreover complains of the endless duration of his sufferings (15:18), while on the other hand he mentions that he has obtained universal recognition as a prophet of Jehovah (15:16). The command not to take a wife (16:2) further indicates that the prophet, who at his calling was only a teenager (1:6, 7) has in the meantime reached a mature age. The words “this once” also (16:21) seem to indicate that the great catastrophe was very near. It is also seen that this discourse must belong to the same period as Jeremiah 13. 3 And their nobles have sent their little ones (Gemini) to the waters: they came to the pits, and found no water (black moon); they (Gemini) returned with their vessels empty (black moon); they were (red radius line) ashamed and confounded, and (sun) covered their heads. 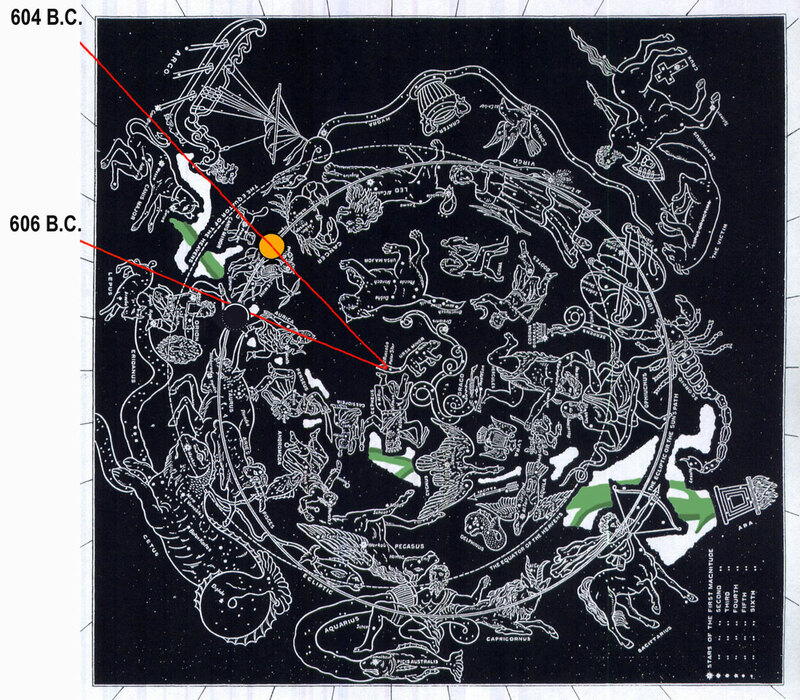 4 Because the ground is chapt, for there was no rain in the earth, the plowmen (Auriga and Gemini with crescent at feet) were (red radius line) ashamed, they (sun) covered their heads. 7 O Lord, though our (Gemini) iniquities (red radius line) testify against us, do thou it for thy name's sake: for our backslidings are many; we have sinned against thee. 9 Why shouldest thou be as a man astonied, as a mighty man that cannot save? yet thou, O Lord (like golden sunlight), art in the midst of us (Gemini), and we are called by thy name; leave us not. 10 Thus saith the Lord unto this people (Gemini), Thus have they loved to wander (Gemini), they have not refrained their feet, therefore the Lord doth not accept them; he will now remember their iniquity, and visit their sins. 11 Then said the Lord unto me, Pray not for this people (Gemini) for their good. 12 When they fast, I will not hear their cry; and when they offer burnt offering and an oblation (sun and moon in Gemini), I will not accept them: but I will consume them by the (lunar) sword, and by the (lunar black) famine, and by the (lunar black) pestilence. 13 Then said I, Ah, Lord God! behold, the (Gemini) prophets say unto them (Gemini), Ye shall not see the (lunar) sword, neither shall ye have (black lunar) famine; but I will give you assured peace in this place. 14 Then the Lord said unto me, The (Gemini) prophets prophesy lies in my name: I sent them not, neither have I commanded them, neither spake unto them: they prophesy unto you a false (solar) vision and divination, and a thing of nought, and the (lunar) deceit of their heart. 15 Therefore thus saith the Lord concerning the (Gemini) prophets that prophesy in my name, and I sent them not, yet they say, (lunar) Sword and (black lunar) famine shall not be in this land; By (lunar) sword and (black lunar) famine shall those prophets be consumed. 16 And the (Gemini) people to whom they prophesy shall be cast out in the (Milky Way) streets of Jerusalem because of the (lunar black) famine and the (lunar) sword; and they shall have none to bury them, them, their (Gemini) wives, nor their (Gemini) sons, nor their (Gemini) daughters: for I will (red radius line) pour their wickedness upon them. 17 Therefore thou shalt say this word unto them; Let mine (lunar and solar) eyes run down with tears night and day, and let them not cease: for the virgin daughter of my people is broken with a great breach, with a very grievous blow. 18 If I go forth into the field, then behold the slain with the (solar and lunar red radius line) sword! and if I enter into the city, then behold them that are sick with famine! yea, both the prophet and the priest (Gemini) go about into a land that they know not. 20 We acknowledge, O Lord, our wickedness, and the iniquity of our (Gemini) fathers: for we have (radius red line) sinned against thee. 15:1 Then said the Lord unto me, Though Moses and Samuel stood before me (Gemini before glorious sun), yet my mind could not be toward this people: cast them out of my sight, and let them go forth. 2 And it shall come to pass, if they say unto thee, Whither shall we go forth? then thou shalt tell them, Thus saith the Lord; Such as are for (lunar grave) death, to death; and such as are for the (lunar) sword, to the sword; and such as are for the (lunar black) famine, to the famine; and such as are for the (lunar pit) captivity, to the captivity. 4 And I will cause them to be removed into all kingdoms of the earth, because of Manasseh the son of Hezekiah king of Judah (Gemini), for that which he did in Jerusalem. 7 And I will (red radius lines) fan them with a fan in the (solar) gates of the land; I will bereave them of (Gemini) children, I will destroy my (Gemini) people since they return not from their ways. 8 Their widows (black Gemini and long line of Milky Way widows) are increased to me above the sand of the seas: I have brought upon them against the mother of the young men (Gemini) a spoiler at noonday (604 B.C. ): I have caused him to fall upon it suddenly, and terrors upon the city. 9 She that hath borne seven languisheth: she hath given up the ghost; her sun is gone down while it was yet day: she hath been (red radius line) ashamed and confounded: and the residue of them will I deliver to the (lunar or red radius line) sword before their (Gemini) enemies, saith the Lord. 12 Shall iron break the northern (red radius line) iron and the (red radius line) steel? 13 Thy substance and thy treasures will I give to the spoil without price, and that for all thy sins, even in all thy (red radius line) borders. 14 And I will make thee to pass with thine enemies (Gemini Milky Way line of people) into a land which thou knowest not: for a (solar) fire is kindled in mine anger, which shall burn upon you Gemini). 15 O Lord, thou knowest: remember me, and visit me, and revenge me of my (Gemini) persecutors; take me not away in thy longsuffering: know that for thy sake I have suffered (solar) rebuke. 16 Thy (golden solar) words were found, and I (Pollux) did eat them; and thy word was unto me the joy and rejoicing of mine heart: for I am called by thy name, O Lord God of hosts. 17 I sat not in the (Gemini) assembly of the mockers, nor rejoiced; I sat alone because of thy hand: for thou hast filled me with indignation. 18 Why is my (red radius line) pain perpetual, and my (red radius line) wound incurable, which refuseth to be healed? wilt thou be altogether unto me as a liar, and as waters that fail? 20 And I will make thee unto this (Gemini) people a (red radius line) fenced (solar) brasen wall: and they shall fight against thee, but they shall not prevail against thee: for I am with thee to save thee and to deliver thee, saith the Lord. 2 Thou shalt not take thee a wife, neither shalt thou have (Gemini) sons or daughters in this place. 4 They shall die of grievous deaths; they shall not be lamented; neither shall they be buried; but they shall be as (lunar black) dung upon the face of the earth: and they shall be consumed by the (lunar) sword, and by (black lunar) famine; and their carcases shall be meat for the fowls of heaven, and for the beasts of the earth. 5 For thus saith the Lord, Enter not into the (red radius line) house of mourning, neither go to lament nor bemoan them: for I have taken away my peace from this people (Gemini), saith the Lord, even lovingkindness and mercies. 7 Neither shall (Gemini) men (red radius line) tear themselves for them in mourning, to comfort them for the dead; neither shall (Gemini) men give them the (solar or lunar) cup of consolation to drink for their father or for their mother. 8 Thou shalt not also go into the (red radius line) house of feasting, to sit with them to eat (solar bread) and to drink (lunar cup). 9 For thus saith the Lord of hosts, the God of Israel; Behold, I will cause to cease out of this place in your eyes, and in your days, the voice of mirth, and the voice of gladness, the voice of the bridegroom (Cepheus), and the voice of the bride (Cassiopeia). 10 And it shall come to pass, when thou shalt shew this (Gemini) people all these (solar and Zodiacal) words, and they shall say unto thee, Wherefore hath the Lord pronounced all this great (solar) evil against us? or what is our (red radius line) iniquity? or what is our sin that we have committed against the Lord our God? 13 Therefore will I (red radius line) cast you out of this land into a land that ye know not, neither ye nor your (Gemini) fathers; and there shall ye (red radius line) serve other (Gemini) gods day and night; where I will not shew you favour. 15 But, The Lord liveth, that (red radius line) brought up the (Gemini) children of Israel from the land of the north, and from all the lands whither he had (red radius line) driven them: and I will bring them again into their land that I gave unto their (Gemini) fathers. 16 Behold, I will send for many (Gemini) fishers, saith the Lord, and they shall (red radius line) fish them; and after will I send for many (Gemini) hunters, and they shall (red radius line) hunt them from every (Milky way) mountain, and from every (Milky way) hill, and out of the (black lunar) holes of the rocks. 17 For mine (solar and lunar) eyes are upon all their ways: they are not hid from my face, neither is their (red radius line) iniquity hid from mine eyes. 18 And first I will recompense their iniquity and their sin double (two red radius lines); because they have (red radius line) defiled my land, they have (red radius line) filled mine inheritance with the carcases of their detestable and abominable things (snakes, crabs, dogs, scorpions, crows, eagles, etc.). 19 O Lord, my strength, and my fortress, and my refuge in the day of affliction, the Gentiles shall come unto thee from the ends of the earth, and shall say, Surely our (Gemini) fathers have (red radius line) inherited lies, vanity, and things wherein there is no profit. 20 Shall a man make (Gemini) gods unto himself, and they are no gods? 21 Therefore, behold, I will this once (604 B.C.) cause them to know, I will cause them to know mine hand and my might; and they shall know that my name is The Lord. 2 Whilst their (Gemini) children remember their altars and their groves by the (green Milky Way) green trees upon the (white Milky Way) high hills. 3 O my (Milky Way) mmountain in the field, I will give thy (gold sun coin) substance and all thy (lunar sword) treasures to the spoil, and thy high places for sin, throughout all thy (red radius line) borders. 4 And thou, even thyself, shalt discontinue from thine heritage that I gave thee; and I will cause thee to serve thine (Gemini) enemies in the land which thou knowest not: for ye have kindled a (solar) fire in mine anger, which shall burn for ever. 8 For he shall be as a (green Milky Way) tree planted by the (green Milky Way) waters, and that spreadeth out her (red radius line) roots by the (green Milky Way) river, and shall not see when (solar) heat cometh, but her leaf shall be green; and shall not be careful in the year of drought, neither shall cease from yielding fruit. 9 The (black lunar) heart is deceitful above all things, and desperately wicked: who can know it? 10 I the Lord search the heart, I try the (red radius line) reins, even to give every man according to his ways, and according to the fruit of his doings. 13 O Lord, the hope of Israel, all that forsake thee shall be (red radius line) ashamed, and they that depart from me shall be (red radius line) written in the earth, because they have forsaken the Lord, the (Milky Way) fountain of living waters. 16 As for me, I have not hastened from being a pastor to follow thee: neither have I desired the woeful day; thou knowest: that which came out of my (Milky Way) lips was (golden sun) right before thee. 18 Let them be confounded that persecute me, but let not me be confounded: let them be dismayed, but let not me be dismayed: bring upon them the day of evil, and destroy them with double destruction (Gemini). 22 Neither carry forth a (red radiusline lumber) burden out of your houses on the sabbath day, neither do ye any work, but hallow ye the sabbath day, as I commanded your (Gemini) fathers. 23 But they obeyed not, neither inclined their (lunar crescent) ear, but made their neck (red radius line) stiff, that they might not (lunar crescent) hear, nor receive instruction. 25 Then shall there enter into the gates of this city (Gemini) kings and (Gemini) princes sitting upon the throne of David, riding in (Auriga) chariots and on horses, they, and their (Gemini) princes, the men of Judah, and the inhabitants of Jerusalem: and this city shall remain for ever. 26 And they shall come from the cities of Judah, and from the places about Jerusalem, and from the land of Benjamin, and from the plain, and from the mountains, and from the south, bringing (solar and lunar) burnt offerings, and sacrifices, and meat offerings, and (red radius line) incense, and bringing sacrifices of praise (solar golden words), unto the house of the Lord. 27 But if ye will not hearken unto me to hallow the sabbath day, and not to bear a (red rdius line) burden, even entering in at the (golden sun) gates of Jerusalem on the sabbath day; then will I kindle a (solar) fire in the gates thereof, and it shall devour the (red radius line) palaces of Jerusalem, and it shall not be quenched.